London: George Allen and Unwin Ltd,, 1946. and its connection with political and social circumstances from the earliest times to the present day. Octavo. Original grey cloth, spine lettered in yellow on a brown background. With the dust jacket. Partially erased gift inscription to front free endpaper. Spine gently rolled, light foxing to edges, offsetting to endpapers, cloth notably fresh; a very good, bright, copy in the faintly soiled jacket with a couple of scuffs and worm holes to panels, chips to spine ends and tips, slight loss to head of spine. First UK edition, first impression. Russell's expansive account of the history of philosophy, ranging from the Orphism of ancient Greece to the logical positivism of the author's present day, was a triumph of his populist craft and is perhaps his most famous book. Written during the Second World War, Russell's project was in part conceived to explain to his audience the exact nature of the "civilisation" for which they were fighting. Appropriately, the dust jackets were printed on the backs of surplus Second World War maps, the present example showing a part of north western France. Simon & Schuster published the first US edition in the preceding year. 2015-03-01. New. Ships with Tracking Number! INTERNATIONAL WORLDWIDE Shipping available. Buy with confidence, excellent customer service! 2015-03-01. Good. Ships with Tracking Number! INTERNATIONAL WORLDWIDE Shipping available. May not contain Access Codes or Supplements. May be ex-library. Shipping & Handling by region. Buy with confidence, excellent customer service! London: George Allen and Unwin Ltd, 1946 1946, 1st English edition, 1st impression, VG in a G DW. In the original oatmeal cloth, edges a little browned & occasional bump. Spine, yellow titles to maroon cloth. Dust Jacket, not clipped (21s. net), some chips to base & loss of a strip at head, some clear tape repairs. Internally, , 5-916 pp, previous owners ink name to fpd, occasional spot to text block edge. No marginal motes. (Folio140*216 mm). (Blackwell A79.2a possibly 20,000 copies printed) Title continues: and its Connection with Political and Social Circumstances from the Earliest Times to the Present Day. The History of Western Philosophy went on to become the best-selling philosophy book of the twentieth century. A dazzlingly ambitious project, it remains unchallenged to this day as the ultimate introduction to Western philosophy. Providing a sophisticated overview of the ideas that have perplexed people from time immemorial, it is 'long on wit, intelligence and curmudgeonly scepticism', as the New York Times noted, and it is this, coupled with the sheer brilliance of its scholarship, that has made Russell's History of Western Philosophy one of the most important philosophical works of all time. 1984-08-09. New. Ships with Tracking Number! INTERNATIONAL WORLDWIDE Shipping available. Buy with confidence, excellent customer service! 2013-04-02. New. Ships with Tracking Number! INTERNATIONAL WORLDWIDE Shipping available. Buy with confidence, excellent customer service! 2013-04-02. Good. Ships with Tracking Number! INTERNATIONAL WORLDWIDE Shipping available. May not contain Access Codes or Supplements. May be ex-library. Shipping & Handling by region. Buy with confidence, excellent customer service! Routledge. Hardcover. 1138127043 Special order direct from the distributor . New. Folio Society, 2008-01-01. Hardcover. LikeNew. . Founded in London in 1947, The Folio Society publishes beautifully crafted, imaginative editions of the worlds great works of fiction and non-fiction offering a rich literary experience to readers of all ages. Complete with traditional slipcase protective covering. Sewn in 16-page sections. Routledge. PAPERBACK. 0415325056 Brand new book.Buy with confidence. Money Back Guarantee.Expedite Shipping Available. International shipment available. . New. Allen & Unwin Lt. London, UK, 1961. 2nd edition. Hardcover. Fine. "Considered to be one of the most important philosophical works of all time, the 'History of Western Philosophy' is a dazzlingly unique exploration of the ideologies of significant philosophers throughout the ages - from Plato and Aristotle through to Spinoza, Kant and the twentieth century. Written by a man who changed the history of philosophy himself, this is an account that has never been rivaled since its first publication over sixty years ago... [It] is still unparalleled in its comprehensiveness, its clarity, its erudition, its grace, and its wit." [Pub. Info] Among the philosophers referenced are: Pythagoras, Heraclitus, Socrates, Plato, Aristotle, the Cynics, the Sceptics, the Epicureans, the Stoics, Augustine, Aquinas, Machiavelli, Erasmus, Bacon, Hobbes, Descartes, Spinoza, Leibniz, Locke, Hume, Rousseau, Kant, Hegel, Schopenhauer, Nietzsche, Marx, James, Dewey, Cantor, Frege, and Whitehead. The book is divided into three sections: Ancient Philosophy, Catholic Philosophy and, Modern Philosophy. No jacket. There is a protective mylar cover. 2ND EDITION. Routledge. Hardcover. 1138127043 Brand New ,Original Book , Direct from Source , Express 5-8 Business days worldwide Delivery. . New. Simon & Schuster, 2007-01-01. Hardcover. Used:Good. Simon & Schuster, 1945-01-01. Hardcover. Used:Good. Unwin Paperbacks, 1984-02-01. Paperback. Used:Good. 1984-08-09. Good. Ships with Tracking Number! INTERNATIONAL WORLDWIDE Shipping available. May not contain Access Codes or Supplements. May be ex-library. Shipping & Handling by region. Buy with confidence, excellent customer service! London: The Folio Society. Hardcover. pp xxvl, 833. An As New slipcase included, fully bound in natural goatskin with gilt and black spine titles and decoration to spine and Boards. 5th printing. TEG. . Fine. 2008. 1st Thus. 2006-04-09. Good. Ships with Tracking Number! INTERNATIONAL WORLDWIDE Shipping available. May not contain Access Codes or Supplements. May be ex-library. Shipping & Handling by region. Buy with confidence, excellent customer service! Simon & Schuster/Touchstone. PAPERBACK. 0671201581 . New. 2014. Routledge, 1993-06-14. 1. Paperback. Used:Good. Simon and Schuster. PAPERBACK. B0007HU1VY New Condition. . New. Simon and Schuster. PAPERBACK. B0007HU1VY Like New Condition. . Fine. Unwin Paperbacks. PAPERBACK. 0041000455 New Condition. . New. Simon & Schuster. Hardcover. 1416554777 New Condition. . New. Routledge. PAPERBACK. 0415325056 Special order direct from the distributor . New. London: George Allen & Unwin. Hardcover. 004109008X pp 842 + advertisements. Prior owner bookplate to FPD and name to flyleaf. 9th printing. Residual tape marks to end papers. . Very Good. 1979. 2nd Edition. Simon and Schuster. Used - Good. Good condition. Owner's name on inside. Routledge/Viva Books/Atlantic/Rupa, 2004. Softcover. New. First published in 1946, History of Western Philosophy went on to become the best-selling philosophy book of the twentieth century. A dazzlingly ambitious project, it remains unchallenged to this day as the ultimate introduction to Western philosophy. Providing a sophisticated overview of the ideas that have perplexed people from time immemorial, it is `long on wit, intelligence and curmudgeonly scepticism`, as the New York Times noted, and it is this, coupled with the sheer brilliance of its scholarship, that has made Russell`s History of Western Philosophy one of the most important philosophical works of all time. Printed Pages: 780. 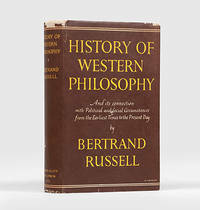 Bertrand Russell - History of Western Philosophy - Paperback. Book. BRAND NEW.